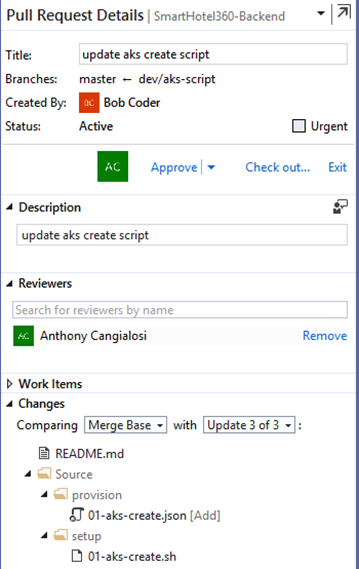 Create, review and comment on Pull Requests from Azure Repos inside Visual Studio. Open Team Explorer and click the Green plug icon in the toolbar. Select an Azure Repo from the list then click Connect. Large organizations may have many teams working together. If you are a member of multiple teams click the title bar where it says “Home”. Then go to “Projects and My Teams” to pick the team where you want to review code. Create new pull requests without leaving the IDE. Review changes, add all the details for the pull request, assign reviewers, and add work items. Use the Build and Code Analysis Results to resolve issues and get green before you submit the PR. Use the new Comparisons window to compare any point in your branch against the latest code to understands that changes that happened over time. Use Comparisons to walk a coworker through your changes or to review a large change before you create a pull request. Checking out a pull request will set that repository to a detached head at the latest commit. 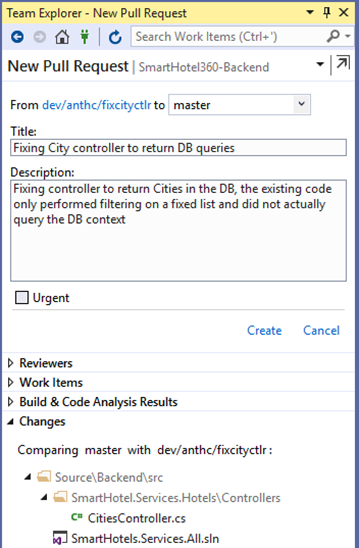 To restore to your previous state use the branch tools in Visual Studio or the Git Checkout command. When you checkout a pull request changed files are not editable. Other files not part of the pull request are editable. This is a temporary limitation until we can make all files editable.